When I received notice on December 7, 2017 that William H. Gass had died at the age of 93, I uttered a four-letter Anglo-Saxon word under my breath—one that I am sure Gass would’ve found absolutely appropriate—and checked the news source: Expatica.com. My mouth contorted itself into a cynical sneer as I thought, “Of course, the French would report this first,” not because I hold any ill-will toward French media, but because the readers of France, Germany, the Netherlands, and others of “Continental Europe” always did seemingly hold the authors labeled “American postmodernists”—Thomas Pynchon, John Barth, Robert Coover, William Gaddis, William Gass, and the like—in much higher regard than those in the US. However, we do live in a time in history when it is sometimes difficult to tell the difference between fact and fiction. So, I did a quick Google search, learning that his Wiki page had already been updated, but I didn’t see anything from a “reputable” source. I went directly to the New York Times site, half expecting one of the top stories to be Gass’s obituary, as has been the case this year when other major cultural influences—John Ashbery, Kate Millett, Sam Shepherd, Chuck Berry (a fellow St. Louisian), and even Hugh Hefner—have died. Nothing. The Washington Post, nada. I then went to the Twitter feed of Gass’s daughter, Catherine, and received the confirmation I sought. While both the New York Times and Washington Post would catch up later that day, at the time, they were not spared my expletive-filled interior monologue mocking them for being “scooped” by Wiki and excoriating them for not showing the respect due to the brilliant critic, philosopher, fiction writer, and translator, William H. Gass, who explained what his literary peers were doing, who coined the word “metafiction” to describe the work of Barth and Borges (as his commentators point out with great frequency), and who helped set the person typing these words down her own forking scholarly path when she was a graduate student at Washington University in St. Louis (often abbreviated to Wash. U., either to set it apart from the other “Washingtons,” or to spare the speaker several syllables). A piece of writing about someone who has died can take many forms: an obituary that focuses on the facts, or one that celebrates; a retrospective, highlighting the individual’s cultural impact (more of which will surely appear in the future); tributes from those who didn’t necessarily know the individual personally and the sharing of memories from those that did; an elegy, or perhaps ten, considering Rilke’s importance to Gass. For me, when attempting to find a form for this occasion, it seemed to demand something else, something that disrupts an orderly story with a beginning and end, “because stories deny that life is no more than an endlessly muddled middle [….] Stories are a bore. What one wants to do with stories is screw them up” (Gass 46). “It’s not William Gass! It’s William Gaddis!” I’m not sure when, exactly, I first heard of Bill Gass; it was certainly while I was still an undergraduate in the late 1990s, and it more likely than not involved the exclamations that start this paragraph—words I have uttered countless times since. Gass and Gaddis, so-called “experimental” postmodernists (although at least one of them would have objected to that description), who became friends sometime after the two met at the 1976 National Book Award Ceremony: Gass in attendance because he had served as one of the judges, Gaddis, in an extremely rare public appearance, because he had been awarded an NBA for JR. These details coupled with the fact that their names begin (or end) “G,” “a,” double consonant has meant that scholars and journalists have been confusing one for the other for decades, including the New York Times. Presumably happy to be of help, William H. Gass called attention to their mistake in identity. While I knew the difference between the two—by the late ’90s I was deep into the literary world of Gaddis (1922-1998) and his friendship with Professor Gass became one of the reasons that I applied to Wash. U.—unfortunately, as a first-generation college student, some of the things that I didn’t grasp included that I had no business in a comparative literature program (Gass’s home department) or what emeritus meant (Gass had retired from teaching by the time I arrived in the fall of 2000). I also didn’t appreciate that one generally shouldn’t go up to a world-renowned author and ask about another writer’s work, but that is what I did not long after I began graduate school at Wash. U. And he did, he spoke of their trips together, like that to the Soviet Union in 1985. 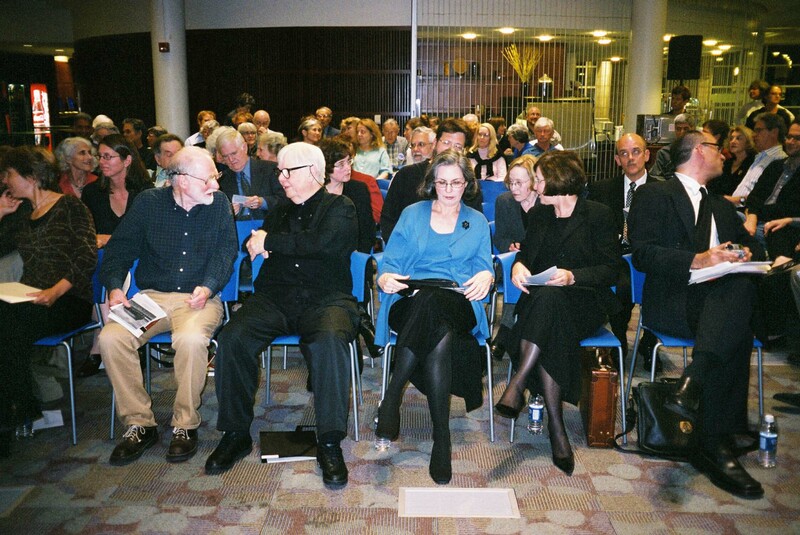 The times that Gass helped bring Gaddis to campus, in person, whether as Hurst Professor in 1979 or as part of the “The Writer and Religion” Conference in 1994. He called Gaddis a “creative complainer” and mentioned a dinner of the American postmodernists, minus Thomas Pynchon, who, of course, didn’t show up—they put a potted plant at his designated place to serve as his substitute (more on this friendship will appear in a forthcoming issue of NDQ). But, Gass didn’t stop there. He facilitated Wash. U.’s acquisition of the William Gaddis Papers, which I helped unload, inventory, and process when they arrived from Long Island around 2002. Later, in Olin’s Special Collections vault, either on my way to or from the location where the boxes of the Gaddis manuscripts and working library were stored, I would walk by Gass’s collection too…and smile. I was later told that one reason Wash. U. was chosen as an appropriate institution for the Gaddis archive was because Gass had mentioned to Gaddis’s children, Matthew and Sarah, that there was a graduate student who was ready to write her dissertation on their father’s work. I’m not sure if that’s true or not, but it’s pretty (for me) to think so. After our initial meeting, I tried to attend as many events featuring Gass as I could. In 2002, I was a part of an intentionally limited audience in Duncker Hall, home of Wash. U.’s English Department, where Gass conversed with Salman Rushdie. In 2004, I sat in silence, straining to catch every word that passed between Gass and Susan Sontag. In both cases, I am somewhat ashamed to admit, I don’t remember a single detail of the discussion. What I do recall is the overwhelming sense that I was in the presence of immense intelligence, wit that could chill to the bone faster than a whiteout wind in North Dakota, Gass’s birthplace, and that I wanted to be a literary critic just like that. This ambition was only further fortified when Gass was fêted for his 80th birthday. The room was filled with prim, upper-class members of the STL County community invited to what they thought would be a somber celebration of an influential author that St. Louis claimed as its own, or so it seemed in my mind. As soon as he took the podium, Gass, to my absolute delight, shattered such pretenses by expertly interweaving some of George Carlin’s infamous seven words into an otherwise polite explanation of what it means to be an octogenarian. In particular, I remember him recounting the great benefits of no longer being required to acknowledge or speak to people that one might have been expected to in the past, as one could simply blame it on bad eyesight (“didn’t see you!”), the loss of hearing (“what was that?”), illness (“I’m not feeling well.”), or, better still, because you’re 80, you just don’t f*cking want to, so you can stroll right on by (I think those words are more or less a direct quote minus the “*;” if not, the words carried similar sentiments). In 2007, years after our first meeting, I had moved on to the University of North Dakota. As I looked up at past UND Writers Conference posters in the English department office, who should be there to greet me? William H. Gass. It was good to hear from you. I’m glad you have a job. North Dakota in general and Grand Forks in particular was once familiar to me, since my parents came from Devils Lake and Larimore. Of course you can use the material you mention as you see fit, if anyone actually wants to see it. That was a conference in the dead of winter, I remember, with Alice Walker, John Barth, and Ishmael Reed. Ken [Kesey] was so drunk or drugged he wouldn’t leave his hotel room, and had to be taken out by medics. Reed was so mean to Alice Walker at a symposium that she left the podium in tears, and my reading of a piece on the culturally empty farmer’s life in the dust bowl angered half the audience which left in protest after a few boos. It was lively. The library is certainly welcome to put my participation on line if they like. I hope they got some of the exchanges. Those might make the tapes interesting. We are fine, though right now we are enjoying the upper 90s. remember it gets mighty hot in Dakota too. While the video of his panel sessions from the 6th Annual UND Writers Conference (1975) survive, only the audio of his reading could be retrieved from the ¾” U-Matic tape on which is was recorded. It features Gass, around fifty-years-old, reading “We Have Not Lived the Right Life,” which would eventually be included in the work that has been called his magnum opus, The Tunnel (1995), begun in 1966, published twenty years after his appearance in Grand Forks. The poet, every artist, is a maker, a maker whose aim is to make something supremely worthwhile, to make something inherently valuable in itself. I am happy this is an old-fashioned view [….] To see the world through words means more than merely grasping it through gossipacious talk or amiable description. Language, unlike any other medium, is the very instrument and organ of the mind [….] Literature is mostly made of mind; and unless that is understood about it, little is understood about it (35-36). He wrote many more versions, tried numerous combinations, flopped about as awkwardly as a boated fish, said the words to himself time and again in a displeased mumble, but he hoped they sang nevertheless, since the sentences he wants to make are like roaches, firm, immobile, shaped, with their shell the same as their soul [….] for every sentence allowed to remain upon the page will resemble the dazed survivors of a battle, after the dead and wounded have been carried away, when their alternatives have been rejected and erased, to leave some words still standing on the field, but standing as markers over graves (38-39). He is no longer with us physically; however, this semester and the next and the next and so on, my students will, no doubt, hear me profess with great enthusiasm the importance paying attention to language and form. Meanwhile, I still aspire to be literary scholar just like Gass, a three-time winner of the National Book Critics Circle Awards for criticism, and will continue to do so, even though I’m afraid, thus far, the closest that I have come is in my frequent use of four-letter words, my painfully slow method of composition, the hope that these words recollecting William H. Gass sing, and that “I’ve added this or that little reality to” the world or to the reader’s consciousness (47) about the man who had and has more influence on my life than he certainly ever knew. Crystal Alberts is an associate professor of English and director of the University of North Dakota Writers Conference. She is currently working on a monograph on Don DeLillo. In addition to DeLillo, she has also published on the writing of, among others, Diane Glancy and, of course, William Gaddis, including William Gaddis, “The Last of Something” (2009) co-edited by Alberts, Christopher Leise, and Birger Vanwesenbeeck, featuring William H. Gass. She earned her Ph.D. from Washington University in St. Louis in 2008.